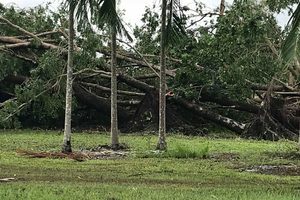 The second round of the MMC Northern Territory PGA Championship was a tale of two halves, with afternoon conditions proving to be far more demanding for scoring than those fortunate enough to tee off early. Players are acclimatising to the warm conditions of the Darwin dry season but the fast, firm nature of the golf course, particularly just off the fairways and green surrounds, are certainly proving to be a test for the player’s skills but perhaps more importantly, their patience levels. With a handful of holes still to play, first round leader Daniel Nisbet (pictured) continued to prevail over the chasing pack but by the end of the day’s play, he had dropped back into a share of the lead with Victorian Adam Burdett at nine-under par by the close of play. In the morning rounds, Burdett reached nine-under par after a 67 to add to his first round of 66. 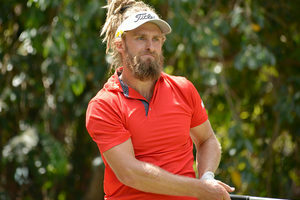 NSW’s Jake Higginbottom has brought his winning pro-am form to the tournament proper with back-to-back-67s to sit at eight-under par, tied with Kade McBride, Tim Stewart, Damien Jordan and the familiar figure of last year’s runner-up, Deyen Lawson, who shot an impressive six-under 65 to vault up the leaderboard. “It has been a good couple of days; I have kept the ball in play and made some putts,” said Burdett. Playing alongside Nisbet, Jack Wilson finished with a three-under 68 for the day to sit at seven-under for the tournament and appears to be enjoying leaning on the local knowledge of his caddie and head greenkeeper, Scott Trembath, who players agree has the course and greens in the best shape they’ve seen at this event. Defending champion Travis Smyth was one of the many being tested by the bouncing ball as he mixed birdies with a few unfortunate ‘others’, including a lost ball to the left of the 8th hole which led to a double-bogey six. Another short miss at the 10th and a bogey at the par-three 14th, where his ball scampered well over the back and right of the green after catching hardpan, had Smyth looking to the heavens but despite his up and down form, Smyth is still within shouting distance after closing with a one-over 72 for a three-under total. That said, he will need to catch fire over the weekend if he harbours any hopes of defending his title. With the halfway cut made at even par, Territory fans will be pleased to see Aaron Pike around at the weekend after shooting a three-under 68 today to sit at one-under for the tournament. 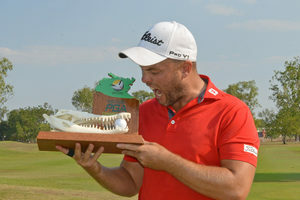 Keeping bogeys from the card and taking advantage of the obvious birdie opportunities that will arise around the Palmerston layout has been the secret to the success of the past winners of this championship. The challenge in 2018 appears to be no different.